Complex protection for small- and medium-sized business from all types of cyber threats with centralized management. The network workstations (the client part) of the company will be protected by the product of "Internet Security" class. Complex protection of PCs and Internet usage with powerful additional functionality such as Firewall and Web-filter. They allow to provide the safe use of the network and to prevent visits to sites that may contain malware. Updating the anti-virus database on company computers is happening centrally and does not require an Internet connection of separate PCs. All the PCs in the corporate network will automatically receive updates from the server part of anti-virus, which has access to all PCs. Administrator controls status of network protection online. If threats were detected on any PC of the network, administrator will see the messages in admin panel. Zillya! Enterprise Security reliably protects your PC against viruses, spyware, trojans and other malware. This is achieved by daily antivirus databases updates in automatic mode and built-in heuristic analyzer that allows to detect and neutralize malicious programs on their behavior basis. The control center of all clients and the anti-virus server settings. Program that brings together all of the client and can control them through the Admin Panel, distributes updates. 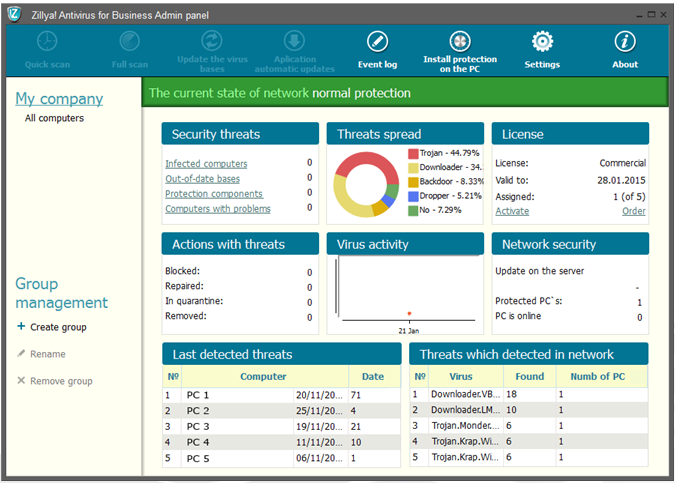 Program that is installed on each of the protected computers; it directly serves as an antivirus protection. Automatic (remote) and local (manually) installation of anti-virus protection for computers. Remote installation - installation of client parts on the computers over a network connection (installation over the network). Local installation - installation via Installer running on client computers that need to be protected. Possibility to manage client part via Internet (the IP address of the server needed). Ability to control of computer network security, scans launch, viewing current events, history, list of tasks, perform actions on the found threats and system software setting firewall rules, individual client antivirus settings from the administrative panel. Creating groups allows group management of computers in the network. Changing the monitor settings file "Watchman"
Required to control the application running on the PC.